The American Board of Forensic Psychology (ABFP) is a member board of the American Board of Professional Psychology (ABPP). The ABPP oversees and authorizes the credentialing activities of thirteen specialty boards. The ABFP is responsible for establishing criteria related to the definition and requirements for education, training, competencies, and the examination, which leads to Board Certification in Forensic Psychology. The ABFP is governed by a Board of Directors who are certified in Forensic Psychology and are representative of the specialty on a national basis. The Board, in association with the American Board of Professional Psychology (ABPP), is responsible for conducting Board examinations in the specialty of Forensic Psychology, mentoring and training examiners, and awarding a Certificate in Forensic Psychology. 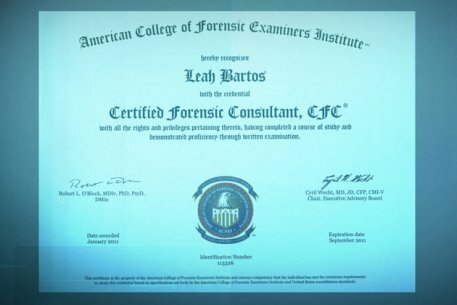 Board Certification by ABFP, is intended to certify that the successful candidate has completed the educational, training and experience requirements of the specialty, including an examination designed to assess the competencies required to provide quality services in the specialty of Forensic Psychology. The primary objective of the ABFP Board Certification process is to recognize, certify, and promote competence in the specialty.